Here at Holmfields, we are dedicated to providing our customers with stunning bespoke furniture for your kitchen, bedroom and home study. All of our furniture is made to order. We take into account everything from your style requirements through to the best ways to use your space. With an excellent reputation for our service in the Lutterworth area, we pride ourselves on the personal service we provide to all of our customers. Holmfields can transform your bedroom and make the most of the space you have with our bespoke furniture, including sliding and fitted wardrobes. You can also choose different finishes including gloss, vinyl and solid wood as well as a palette of paint colours. Our designers are able to create fitted kitchens to match your exact specifications. Appliances and accessories are available for you to choose from that can help you to add the finishing touches to your brand new kitchen. 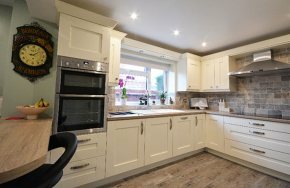 Our team have many years of experience when fitting kitchens and have worked in a variety of room sizes. 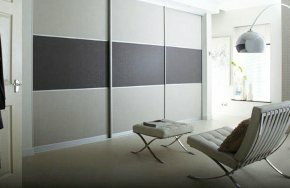 We can work with you to provide some dynamic and innovative space saving solutions. 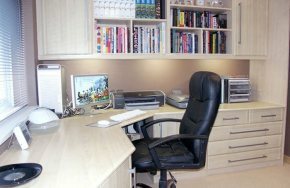 We also specialise in the creation and installation of home offices. Our main aim is to design and fit a home office that is specifically tailored to your requirements, taking into consideration the equipment you need to work from home. We create original designs that utilise your space in the best possible way, creating a stylish and highly functional home study. Our impressive showroom is based just a short drive along the M1 from Lutterworth. We encourage our customers to visit us and view the collection of fitted furniture we have available. During your visit, we can offer you our expert advice and create a computerised design of how your finished product will look. Call our friendly team today on 0116 255 6669 to discuss pricing and design ideas, or email us through our online contact form.